Supported by the central place of France at Cospas-Sarsat Joint committee, composed of France, USA, Russia and Canada, Galileo will play a central role in the evolution of the system. Galileo will, in particular, offer an additional service, the Return-Link Service (RLS ) designed to remotely interact with the beacon. This interaction will be ensured by a dissemination of short messages in the Galileo Open Service signal to any identified beacon, which paves the way for a two-way communication link with the beacon. The definition of the RLM (Return-Link Message) and its operational usages are still under construction at Cospas-Sarst committee level as well as at ICAO level. Recent drama in civil aviation leading to losses of several aircrafts (AF447, MH370, etc…) have shown first an incapacity of quickly dispatching rescue means for potential survivals, and second, a surprising incapacity of determining the position of the aircrafts wreck, generating major researches expenses. This situation led to the creation of a joint RTCA/Eurocae working area in SC229/WG98 group; Its objective: Define new solutions to cope with the current situation. It mirrors the ICAO recommendations raised during the Second High-Level Safety Conference (HLSC 2015) in Montreal, where the necessity to increase significantly the effectiveness of the current alerting and Search & Rescue services has been released. The conference raised a list a key improvement areas and paved the way for the development of an integrated system, the Global Aeronautical Distress and Safety System (GADSS) that addresses all the distress flight phases. Based on these initiatives, a regulation will impose in-flight activations of aircraft S&R beacons for 2021. The project intends to develop a system approach and key sub-systems before testing in-flight activation concepts that are allowed by Galileo. 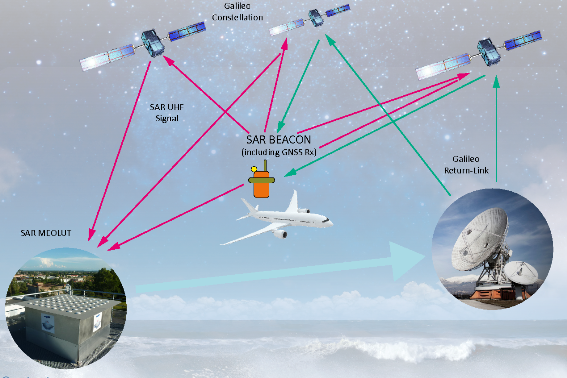 The project will reversely turn Galileo SAR service unique relying on innovative uses of Return Link Messages that will pave the way for a better in-flight safety. The project relies on a strong consortium counting on a unique presence in Civil Aviation regulation bodies, experts in SAR domains, experts in GNSS domains and market leaders all along the value chain. Phase 1: definition of the use cases, and operational procedures. The task will take as an input the various accidents and incidents listed by the WG98. It will define the way Galileo SAR can bring answers to the situation, and will define experimentations to be carried out. Phase 2 : The definition and development of the system to be used for experimentation and striking demonstrations; New Generation beacons with embedded low power consumption GNSS receiver, New generation MEOLUT using active antenna, interconnection between the MEOLUT and the F-MCC to the RLSP in order to use the RLM, algorithms to automatically detect emergency situations. A second experimental and demonstration phase in Dakar, carried out with ASECNA’s ATR for a dissemination over Africa. Phase 4 : Finally the project will exploit the results for dissemination within the EUROCAE WG 98 group, at ICAO level, at COSPAS-SARSAT level, and of course for Galileo. GRICAS is a unique opportunity to bring to the fore an essential Galileo differentiator compared to other GNSS, e.g. a rich SAR service with a unique Return link service, and to promote a decisive contribution of Galileo to worldwide aviation safety.